IT’S been less than a year since Jarryd Hayne announced he was leaving Australia to pursue his NFL dream — but today that dream became a reality. These days he’s catching a pigskin instead of a Steeden in a game that values forward passes instead of penalising them, but the man from Minto in Sydney’s western suburbs showed he would never forget where he came from. After his San Francisco 49ers beat the Minnesota Vikings, Hayne posed for a photo with fans holding an Australian flag. And it sure meant a lot to him. “That was good (posing with the flag). It was a bit emotional seeing that flag and that brought back memories, realising how far I’ve come and I guess everyone supporting me,” said Hayne. In an emotional Instagram post, Hayne thanked all his supporters and said he was “proud to represent the flag”. It was not the start Hayne and his massive Australian following had been hoping for in his NFL debut though. When he was thrown into the game late in the first quarter for his first taste of NFL football, he fumbled a punt, losing the ball and it was recovered by the Vikings. 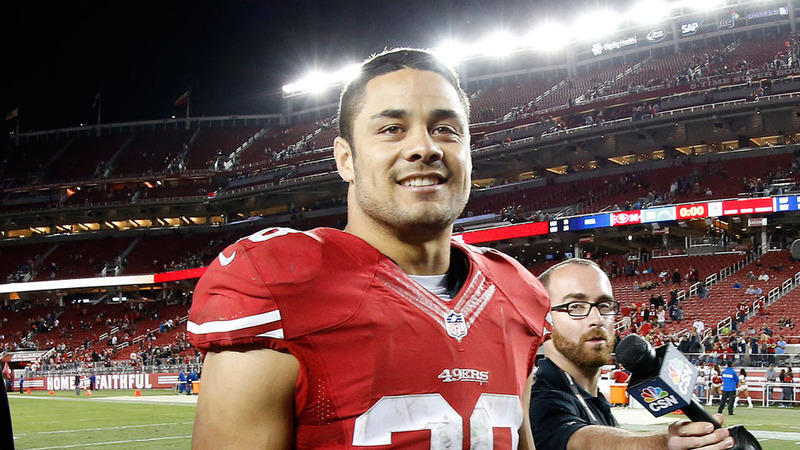 Hayne was seen cursing as he made his way from the field for the San Francisco 49ers. Speaking to Australian radio duo Hamish & Andy on 2DayFM 104.1 after the game, Hayne said he couldn’t have imagined a worse start to his NFL career. “You’re just like, ‘S***. What worse could have happened?’ It was just one of those things, you just worry abut the next play and that’s it,” said Hayne. He was adamant the mistake had nothing to do with nerves, and was pleased he managed to move on and get a first-start win. “I was good, I felt good and I just got mixed up with the read when the ball was in the air. Commentators and social media also had their say on Hayne’s horror start. ESPN writer Paul Gutierrez said Hayne’s debut “was an inauspicious one, to say the least” after claiming he was a “somewhat surprising inclusion” in the active roster to begin with. Hayne likened his first-quarter blunder to his Origin debut back in 2007 when a pass in his own in-goal led to a Queensland try. “I did a similar thing in Origin in my debut game,” Hayne said. “I gave away a try. I threw the ball when I shouldn’t have. It was kind of similar. 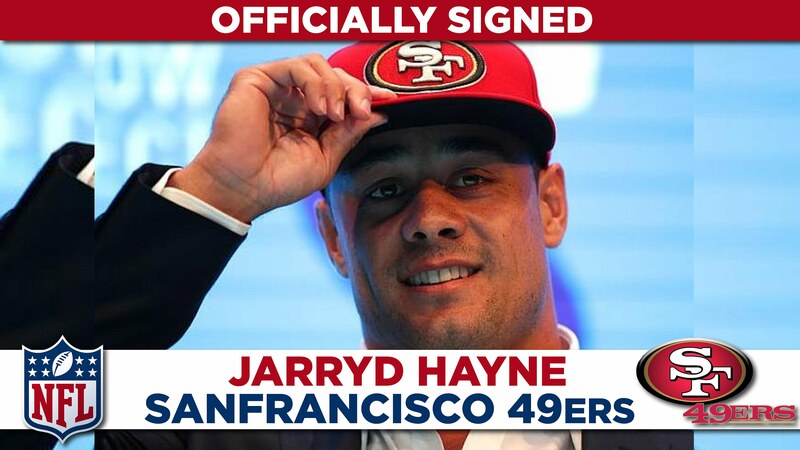 Like, s***, I didn’t want that to happen,” said Hayne. Hayne said it was tough to reflect on his journey because he knows he’s still got so much more to learn. While all his supporters were cheering when they found out he’d made the 49ers’ active list, Hayne revealed there was no special moment where he was told he’d be playing. “I didn’t really find out … I got a couple of reps about two days ago and that’s when it started ticking over that I might get the call up,” said Hayne. Jim Tomsula has been reluctant to contribute to the hype about the Hayne Plane during the pre-season, but he offered support to the 27-year-old when asked about his performance. Without referencing Hayne’s blunder directly, Tomsula praised the 49ers’ special teams outfit for overcoming adversity in a post-game locker room address. “You young guys, you rookies, we’ve been talking about you for a little while now … special teams, a couple of things happened there, but you overcame it. You understand that? You overcame it, we’re fine,” said Tomsula. 49ers beat reporter Cam Inman reported that Hayne also received encouragement from special teams coordinator Thomas McGaughey, who advised him to forget about his dropped catch and worry about the next play. The Sacramento Bee’s Matt Barrows summarised it best when it was confirmed Hayne was set to suit up for the 49ers. “You can exhale, Australia,” Barrows wrote. “Jarryd Hayne, that continent’s favourite son, is in uniform for tonight’s game against the Vikings and presumably will return punts. “Hayne was excellent at that during the preseason, returning nine punts with an 18.1-yard average and showing an aggressive instinct common to all the best return men. Sports Illustrated’s Peter King, for some unknown reason, limited the celebrations to Sydney and the Australian capital.